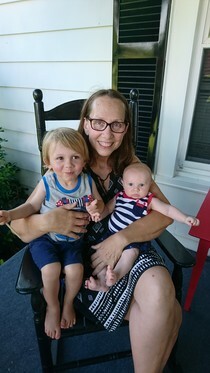 Rebecca “Becky” Roff Solomon, 57, of 1855 Cunningham Rd., Semora, passed into the arms of her Savior, Jesus Christ on December 4, 2018 at Hospice of Alamance/Caswell. She was preceded in death by her parents, Calvin Gordon Roff Sr. and Dorothy Seajack Roff. She is survived by her husband Robert “Keith” Solomon, Jr. of the home. In addition to her husband, she is survived by two daughters, Jessica Simpson and husband Mark of San Diego, CA and Angela Pabich of Baltimore, MD; son, Kevin Pabich and wife Katie of Baltimore, MD; sister, Angie Mundie and husband Tony of Baltimore, MD; brother, Calvin Roff, Jr. and wife Debbie of Baltimore, MD; and four grandchildren, Calvin and Desmond Simpson, Kent and Kamille Pabich. Becky received an Associate’s degree and worked as a Dental Assistant. She was of the Baptist faith. She was a member of the Semora Ruritan Club and a member of Semora Baptist Church where she was on the Grounds and Décor. Committee. Becky loved arts and crafts, painting and sewing. She especially loved spending time with her family and friends. A Funeral Service will be held at 11:00 am on Saturday, December 8, 2018 at Semora Baptist Church by Pastor John Codispoti. Interment will follow in the church cemetery. The family will receive friends from 6:00-7:30 pm Friday, December 7, 2018 at Semora Baptist Church and other times at the home. In lieu of flowers, memorials may be made to Semora Baptist Church, 14450 NC Hwy 119N, Semora, NC 27343. Condolences may be sent to www.harrelsonfs.com. Harrelson Funeral Services of Yanceyville, N.C. is privileged to be serving the Solomon Family.